I found this little gem while vacationing in London last spring. 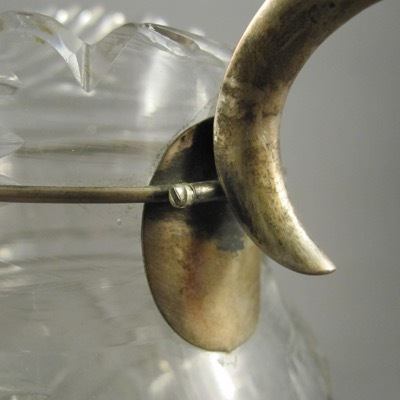 While the majority of my collection is comprised of ceramics, I marvel at inventive repairs done on glass, which seem even more astonishing to me. 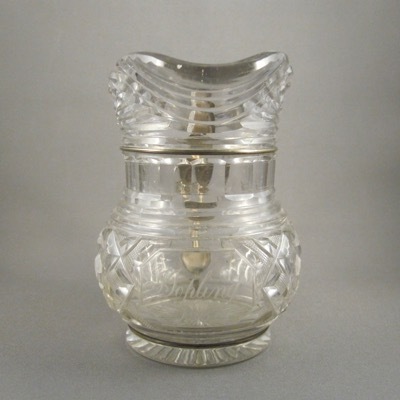 This cut lead crystal pear shaped jug stands 4.75 inches tall, has an exaggerated spout with scalloped rim and heavily cut patterns. 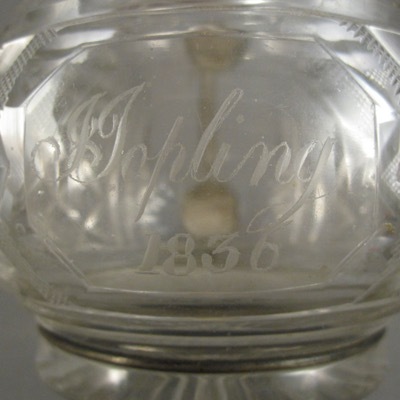 It was made during the Georgian era and is dated 1836, along with the name J. Jopling on a front panel. 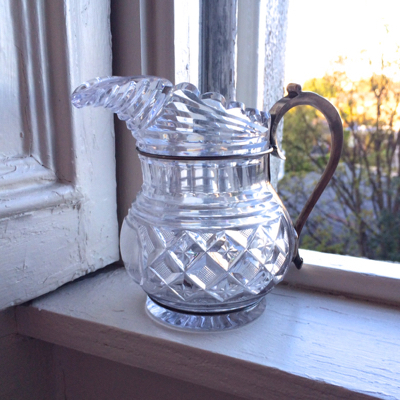 It is missing its original applied glass handle but in my opinion, the innovative replacement handle is much more interesting than the original one would have been. 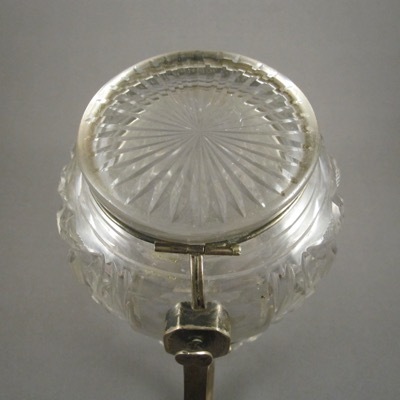 Someone was clumsy in the mid 19th century and soon after the glass handle snapped off, it was taken to a silversmith who fashioned an elaborate silver replacement. 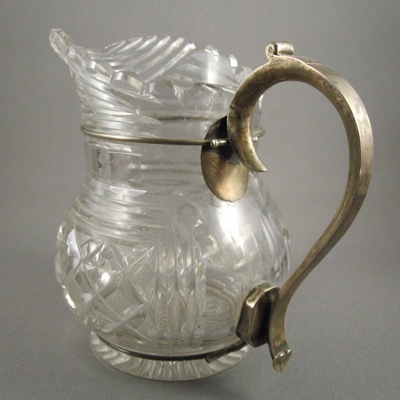 A clever repair was done incorporating a delicately proportioned silver-plated handle and support wires and cuffs so that no holes were drilled through the body of the jug. 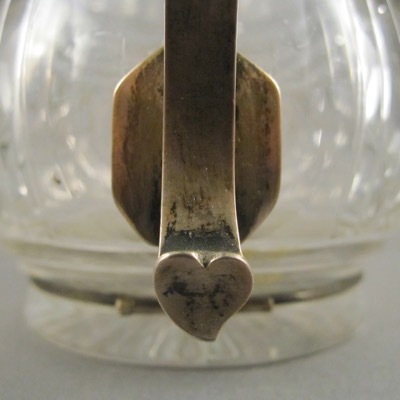 Tiny screws at the back near the handle terminals allow for the handle to be completely removed without damage to the fragile glass. As much as I love the workmanship on this early repair, my only regret is that the repairer did not sign his work. 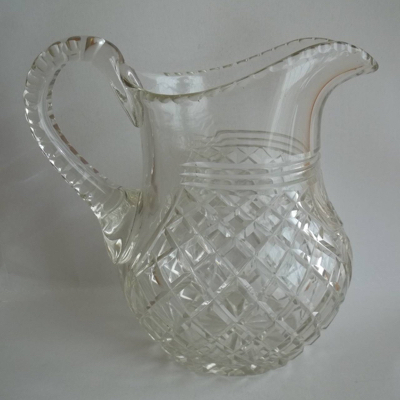 This jug with similar form maintains its original handle and gives you an idea of what my jug might have looked like intact.